The Atlas Defender Junior Roost Deflector is a more traditionally styled roost guard that packs modern features into a design made specifically for older youth in the 9 to 13 year old range. If you look at the deflector as a whole, you’ll see the familiar, large panels of hard plastic on both the front and back along with impact foam that extends over the kidneys and additional panels over the shoulder/collar bone. This layout creates a good amount of protection from roost and other impacts, but it also manages to stay lightweight and very low profile—making it a great choice for wearing over or under a jersey. The more nuanced details Atlas put into the Defender Junior start with the waterproof foam that’s used all across the deflector. This foam helps absorb impact, but it doesn’t absorb water. So if it rains, your child won’t be weighed down by waterlogged foam. That also means you can simply hose off the deflector when it’s dirty without being concerned about the foam sucking up water and breaking down. Finally and most importantly, the Defender Junior is fully compatible with neck braces thanks to a modular design that can be customized to fit your child’s brace without any interference. Simply remove the upper portion of the back panel, fit the neck brace, and your child will ride with that extra amount of safety that can make all the difference in preventing an injury. Purpose Built – The Defender design incorporates unique fit, function, and adjustment based around the features of Atlas’ brace family. Modular – Interchangeable parts and straps allow for 8 unique configurations that can be worn with or without a neck brace, over or under a jersey, and in either \full or front only versions. Waterproof – High performance foam is lightweight, tough, comfortable, and waterproof. No more added water weight, or damp feeling after washing. The Defender is the perfect addition to any brace. How do I get replacement bolts for the atlas defender junior roost? BEST ANSWER: Please contact us at 661-253-1592. We can send out replacements. How do I measure for chest protector? 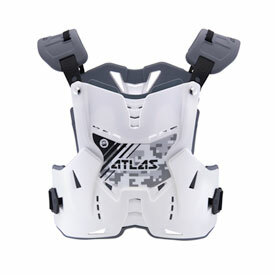 BEST ANSWER: Atlas doesn't provide much information on the sizing of the chest protectors. This particular brace will fit youth riders. I would suggest that if you're wearing a youth size jersey then this protector should fit well.